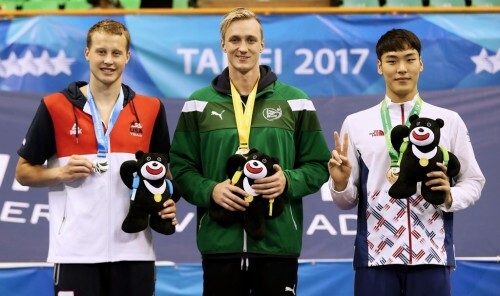 2 017 World University Games 50m Backstroke Final Medalists USA’s Justin Rees (Silver), Ireland’s Shane Ryan (Gold) and Youngjun Won (Bronze) of Republic of Korea on the podium. Shane Ryan has won gold in the 50m Backstroke at the World University in Taipei City setting a new Irish record of 24.72 in the process. Ryan had a great start to the race and maintained his lead all the way to grab the gold medal by 0.01 of a second from Andrew Rees (USA) with Youngjun Won in third for Korea. The Penn State University student follows in the footsteps of Gary O’Toole who took gold in the 200m Breaststroke at the 1991 Games held in Sheffield. 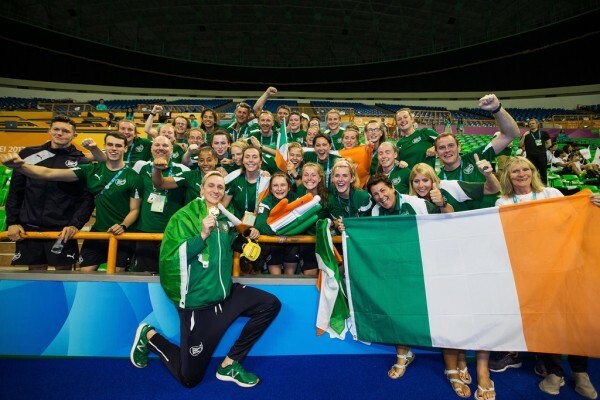 Ireland’s Shane Ryan celebrates winning with other members of Team Ireland.